[From Stinson et al. 1994; Wilson and Randall 2005; Goodman et al. 2006] Adults large, 13-15 mm in length (excluding snout; to 19 mm with snout), 3.0-5.5 mm in width; snout short and thick; flightless (elytra immobile); dorsum mottled gray and brown or gray and black. Sexes similar, reliably differentiated by abdominal shape: female abdomen caudally tapered (pointed) with cloacal opening facing outward, male abdomen with terminal segments deflexed ventrally causing cloacal opening to face ventrally; last two tergites of male sclerotized, only terminal tergite sclerotized in female. Mature larvae C-shaped with brown head capsule, about 13 mm in length, found in root galls. Univoltine (one generation per year). Phenology similar for wild and captive populations. Adults mid-July to mid-September, oviposition early August to September and early October (mid-November in captivity in Europe), larvae early August to the following mid-July (Stinson et al. 1994; Wikeem et al. 1999; Wilson and Randall 2005). 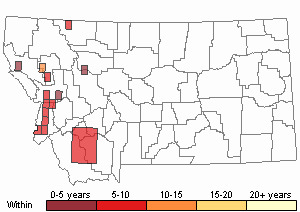 In western Montana, adults active mid-July to October (Story et al. 2006; Corn et al. 2009). Probably best determined from other weevil species by a combination of color, size, and host plant limitation (i.e., restricted to knapweeds). Native range: Palearctic; central, eastern, and southern Europe and Asia Minor, including Austria, Bulgaria, Greece, central and western Hungary, Kirgizstan, Macedonia, Romania, Russia, Slovakia, Syria, Turkey, and Ukraine, southeast to the Caucasus (Stinson et al. 1994). North America: Introduced in Canada and the US. 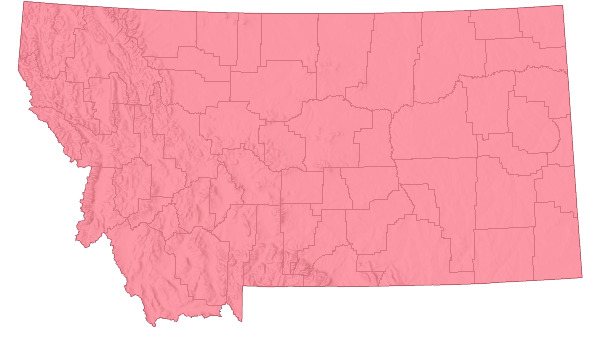 First introduced in British Columbia in 1987, Montana in 1988 (Stinson et al. 1994). In US, established in Colorado, Idaho, Montana, Oregon, Washington and several other western states (Sheley et al. 1998; Clark et al. 2001); in Colorado to at least 2100 m elevation (Seastedt et al. 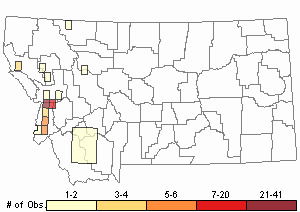 2007; Knochel and Seastedt 2010), elsewhere (Idaho, Montana, Washington) to at least 1880 m elevation, but best established in knapweed stands between 910 to 1515 m elevation (Clark et al. 2001). Established in Montana following delivery in 1988 and release in 1989 (Story et al. 1997); west of the Continental Divide to at least 1100 m elevation. Non-migratory. Adults weak fliers or flightless (the elytra are immobile) and have low dispersal capability (Stinson et al. 1994; Wilson and Randall 2005). Larvae and adults largely specialized on Spotted Knapweed (Centaurea maculosa) as the primary host plant, also to a lesser extent Diffuse Knapweed (Centaurea diffusa) (Stinson et al. 1994; Sheley et al. 1998; Wilson and Randall 2005; Duncan et al. 2011); also reported feeding on Achillea millefolium in Europe. Adults feed extensively on host plant leaves of all ages but favor younger leaves towards center of rosettes. In captive feeding trials of 71 plant species, 36 were not attacked, insignificant nibbling reported on another 15 species (in the genera Carduus, Centaurea, Chrysanthemum, Helianthus, Leuzea, Onopordum, Reseda, Senecio, Silybum, Symphyotrichum), and extensive feeding on at least some plants of Acroptilon repens, Cynara scolymus, Plectocephalus americanus, as well as 17 species of Centaurea. Oviposition in captivity reported for Carduus acanthoides, Centaurea (17 species), Crupina vulgaris, Cynara scolymus, and Mantiscala salmantica, but no development beyond L1 instar except for Centaurea diffusa, C. maculata, and three other knapweed species (Stinson et al. 1994). Larvae feed within the roots, mining out the cortex up to 8 cm below the root collar (Stinson et al. 1994; Wilson and Randall 2005). Adults live 8-15 weeks in captivity. Average life-time fecundity of captive females about 40-75 eggs. Females typically lay eggs singly on host plant root or root crown by digging a tunnel through the soil at base of rosette, chewing an attachment site for the egg, exiting and backing into hole to oviposit, exiting and returning head-first to secure egg to root or root collar by encasing egg in soil and plant debris held with beetle secretions, then filling in tunnel (Stinson et al. 1994). Eggs hatch in 10-12 days, L1 instar begins mining to root cortex, develop to L2 instar in 14-28 days (depending on temperature), overwinters as L2 instar (sometimes L1 instar), continues development with onset of warmer spring temperatures to L3 and L4 instars in mined root area forming a gall, pupates in gall, adults eclose (emerge from pupae) in about 14 days (Stinson et al. 1994; Wilson and Randall 2005). Eggs and L1 instars the predominant stage of diapause (ovewintering) in western Montana (Corn et al. 2009). Biological control agents are most effective when integrated with other biocontrol and traditional methods (Wilson and Randall 2005; Duncan et al. 2011). With Spotted Knapweed (Centaurea maculata), and Diffuse Knapweed (Centaurea difusa) thirteen introduced insect species attack various parts of the host plant (including flowers, seed capsules, foliage, stems, and roots). 1) Determine efficacy (ability to control the target weed), host plant specificity, and biocontrol availability for the biocontrol insects to be used. 2) Select release sites based on their desired function. Field nursery sites (for future biocontrol collection and redistribution) should exceed 2 acres with fairly continuous distribution of knapweed (with at least 3 knapweed plants per square yard), be safe from disturbance for 3-5 years, and accessible for regular monitoring. Sites for long-term monitoring should be buffered from other weed management programs and disturbance (grazing). Sites not intended for monitoring or biocontrol collection should be sufficiently large and free from disturbance to provide the agents the best possible chance to survive and flourish. 3) Agents should be stored and transported in sturdy containers that are kept shaded, cool, and well ventilated. An example is a pint-sized, nonwaxed, paperboard carton. Paper bags can work as temporary containers, so long as they do not get wet or squashed; avoid plastic bags, glass or metal containers. Prepare containers for agents by adding paper toweling to absorb moisture and povide insects as crawling surface. Do not add water. Transport containers in a large cooler with pre-frozen icepacks. Specifically to Cyphocleonus achates, adults the life stage to release. Adults can be obtained at sites with established populations by hand picking from flowering plants or sweep netting, then transferred to containers; sweeping reported to be unproductive relative to hand picking (Story et al. 1997). The knapweed root weevil can also be mass-reared in field corrals (Story et al. 1996; Story and White 2010) or year-round in captivity (Goodman et al. 2006). At least 200 adult beetles are recommended for initial release of stem-boring weevils, although successful establishment can occur with fewer adults (Clark et al. 2001). Collect adults that are actively feeding and mating on top portions of plants. Transport and release beetles as soon as possible (preferably within 48 hours). Release should occur in good weather (warm, calm, cloudless) in early morning or cooler evening hours (avoid rain and very hot conditions) during peak emergence (typically August). Release on the ground at base of stems in dense stands of young host plants. Clark, S.E., R.G. Van Drieshce, N. Sturdevant, J. Elkinton, and J.P. Buonaccorsi. 2001. Effects of site characteristics and release history on establishment of Agapeta zoegana (Lepidoptera: Cochylidae) and Cyphocleonus achates (Coleoptera: Curculionidae), root-feeding herbivores of Spotted Knapweed, Centaurea maculosa. Biological Control. 22:122-130. Corn, J.G., J.M. Story, and L.J. White. 2009. Comparison of larval development and overwintering stages of the Spotted Knapweed biological control agents Agapeta zoegana (Lepidoptera: Totricidae) and Cyphocleonus achates (Coleoptera: Curculionidae) in Montana versus eastern Europe. Environmental Entomology. 38:971-976. Duncan, C., and J. Story, R. Sheley, H. Parkinson, and J. Mangold. 2011. 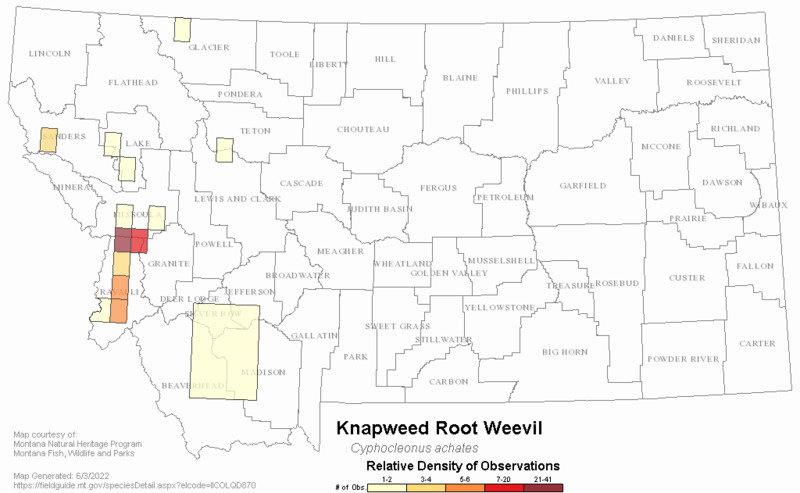 Biology, ecology and management of Montana knapweeds. Montana State University Extension. Bozeman, MT. 19p. Goodman, CL, S.J. Phipps, R.M. Wagner, P. Peters, M.K. Wright, H. Nabli, S. Saathoff, B. Vickers, J.J> Grasela, and A.H. McIntosh. 2006. Growth and development of the knapweed root weevil, Cyphocleonus achates, on a meridic larval diet. Biological Control. 36:238-246. Knochel, D.G. and T.R. Seastedt. 2010. Reconciling contradictory findings of herbivore impacts on Spotted Knapweed (Centaurea stoebe) growth and reproduction. Ecological Applications. 20:1903-1912. Seastedt, T.R.. D.G. Knochel, M. Garmoe, S.A. Shosky. 2007. Interactions and effects of multiple biological control insects on Diffuse and Spotted Knapweed in the Front Range of Colorado. Biological Control. 45:345-354. Sheley, R.L., J.S. Jacobs, and M.F. Carpinelli. 1998. Distribution, biology, and management of Diffuse Knapweed (Centaurea diffusa) and Spotted Knapweed (Centaurea maculosa). Weed Technology. 12:353-362. Story, J.M., W.R. Good, and L.J. White. 1997. First report of the establishment of Cyphocleonus achates (Fahraeus)(Coleoptera:Curculionidae) on Spotted Knapweed, Centaurea maculosa Lamarck, in the United States. Canadian Entomologist 129:373-374. Story, JM and L.J. White. 2010. Revised methods for the mass-rearing of the Spotted Knapweed biological control agent, Cyphocleonus achates (Coleoptera: Curculionidae), in field corrals. Biocontrol Science and Technology. 20:853-858. Story, JM, L.J. White, and W.R. Good. 1996. Propagation of Cyphocleonus achates (Fahraeus)(Coleoptera: Curculionidae) for biological control of Spotted Knapweed: procedures and cost. Biological Control. 7:167-171. Story, JM; Callan, NW, J.G. Corn, and L.J. White. 2006. 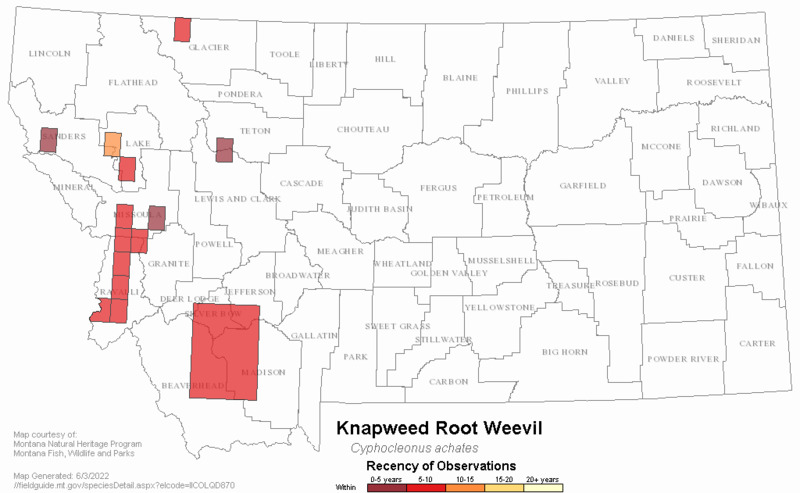 Decline of Spotted Knapweed density at two sites in western Montana with large populations of the introduced root weevil, Cyphocleonus achates (Fahraeus). Biological Control. 38:227-232. Wikeem, B.M. and G.W. Powell. 1999. Biology of Cyphocleonus achates (Coleoptera: Cuculionidae), propagated for the biological control of knapweeds (Asteraceae). Canadian Entomologist. 131.243-250. Web Search Engines for Articles on "Knapweed Root Weevil"